Join us this month as we explore Shimring, with GM Twiggyleaf and crew! It’s a D&D 3.5 campaign you won’t want to miss! Now, on with the show! I used to play music but now work in civil utilities administration, where only one other person seems to know anything about roleplaying. I am not “emotionally attached” to anyone and am quite happy designing dungeons. I get a bit carried away with player aids and spend hours drawing up cards and creating spreadsheets and Publisher documents to make our lives easier, and hopefully, more enjoyable at the table. My other great joy is cinema and I love a good fantasy or science fantasy blockbuster. My best film of last year was “Drive.” The year before it was “Inception” and this year it will be “The Hobbit – Part One”, although I will also be looking forward to “Skyfall”. Although I don’t play music myself any more I am a great fan of various types of music and spend equal amounts of time delving into my own collection to retrieve musical memories and searching the internet via YouTube, Spotify and NBTMusicRadio to discover new sounds and artists. Tell us about Shimring, in a nutshell. Shimring is a small world that is both the cradle of life within the multiverse as well as an arena where universally epic quests are played out by characters from various planes of existence, under the guidance of an “uberdeity” called the Droomalith, who is woken by the Lady of Pain in Sigil when serious universal inbalances need to be restored. The world itself is created from the primeval wyrm, the Dracolich, whose chaotic powers the Droomalith supressed and used to create the bonds holding the universes together. The body of the Dracolich is knit into the very fibre of Shimring, and its Heart is a powerful artifact that enables the cojoining of planes and exerts power over Gods. Questors, chosen by their various deities as representatives in The Great Quest, must find the Heart of the Dracolich and, using its powers to create cojoined planes, travel through three Primordial Temples, each quest having divine and universal significance, until they arrive on the Isle of Horus and place the Heart into the chest cavity of the Dracolich, bringing it to life to enact the Final Quest. So far the players have spoken to The Lady of Pain in Sigil, entered Greyhawk and imprisoned Iuz, travelled via a timeloop to Gossamer in the Demonweb and resurrected Vhaeraun, and are presently in Faerun, destined to a meeting with Gond! We play once a week in Glasgow in Scotland. For about 6 years we played in a Hall in Glasgow’s West End, hired every Tuesday night by Glasgow Gaming Group, which is a group of gamers incorporating strategy gamers, card gamers and roleplayers. For the last six months, however, we have been playing at the house of one of the group members. We usually start a game around 6pm and end it around 10pm. Occasionally we arrange an all day Saturday or Sunday session. Speaking of your players, how long have you known them and how long has your group been together? How long has Shimring been going on? Two of our present group I have known for about seven years. We met at the Glasgow Gaming Group, looking for a regular RPG. Three members I have only known for about six months. Our old group split up and we had to replenish. Matthew started running Expedition to Undermountain, starting at Level One, as we felt it would be easier to attract newcomers with a low level dungeon. Shimring has been going on for almost three years on and off. 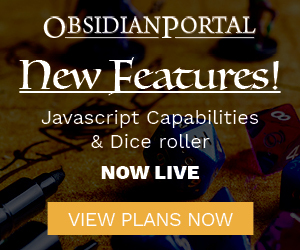 I started it when I first heard about Obsidian Portal, which seemed the ideal platform for me to design a campaign by myself after previously running Expedition to the Demonweb Pits. However, it is not always Shimring that we play, as we take turns at GMing. This factor was integral to the design of Shimring, which I therefore arranged to be played in smaller sections, so that we could have breaks in between to play other campaigns. You run D&D 3.5 right? Is there any reason for not moving over to pathfinder? What are your thoughts on the upcoming “D&D Next”? At the beginning of Shimring when I just had a concept in my head but had not started fleshing it out, I asked our group whether they would like me to design it in D&D4e. One group member in particular was dead against that so I went with consensus. Everybody was much more comfortable playing 3.5. At the time, we were not even sure where Pathfinder was going so it never even came up in the conversation. I think most of us felt that we had spent a load of money on books and could still utilize what we had without changing systems. Now that I have been partaking in Beaumain’s “It’s Good to be Evil” campaign, I must say I do like Pathfinder very much. It has some excellent additions to the Core 3.5 rules and I certainly would not rule it out for future projects, although I will also be very open to D&D Next. I don’t really know much about “Next” yet, but myself and one of my players have an introductory session booked in September. We shall see! Speaking of old D&D and new D&D. Rumors are they are going to “resurrect” a campaign setting at gencon. More rumors say it might be Greyhawk, does this excite you? Well, being in Glasgow, I won’t be able to partake in Gencon but an old system resurrection does not sound bad at all. Many of us veterans started out in the Greyhawk system, so even if we now play in Faerun or Eberron or some home-baked campaign setting, there is “retrovalue” in wheeling out the old names. Meet up with Modenkainen, say a silent prayer to Boccob, whatever! There is always a place for nostalgia, I think! I mean, we still listen to our old Bowie albums, don’t we? I see Shimring has a planned end questline, a lot of games don’t have finite story arcs. What are your thoughts on running games like this instead of sandbox games? I like conclusions. I am quite open to a sort of sandbox approach in the middle but I guess in essence I still like a story to have a definite beginning and end. Most games I have ever run, or indeed played in, have been fairly structured and I think I would have to say I prefer it that way. I like the sense of accomplishment one gets when one reaches the climactic scene with the Big Bad Evil Guy and the balance of the Universe is restored! Not specific to any event in the game, the most memorable parts for me are when the players, acting out their characters in some of the absurd situations that arise, cause me to laugh uncontrollably. I always award Bonus Experience points whenever this happens. I once ran a campaign where I awarded Experience Points for humour only. That was a different group but even to this day, and with my present group of players, I never get any complaints about Bonus XP! Don’t be too strict on players when it comes to rules. If a player gets creative and does something outlandish, ride with it, even if it overturns rules or upsets your plans. As creators and storytellers, we GMs often get quite involved in our creations and it is sometimes easy to forget that the main joy of the game does not come from the page but from the interaction between players. Be generous with player aids, cues and clues. Help players along if they are struggling to remember details. It is not really their job to remember details. That is the GM’s job. Never underestimate the power of pictures and short descriptions. They breathe life into any dungeon. I usually have a few printouts ready on cards that I can just hold up or pass around during a game. This one is especially for newcomers to Obsidian Portal who are looking to involve their players in the site they are creating. This is fabulous and for those fortunate enough to have strong player involvement, it is a truly great thing. But it is NOT the most important thing. And many players do not _really_ want to get involved in your site. _Know_ that *It’s OK! * A vibrant and well organized site will help you have a better game at the table, so if you are not getting the online involvement you were expecting, don’t be too worried about it! Put more energy into enjoying your game! Thanks to my players and fellow OP supporters! That wraps it up for this month portallers! We hope to see as many of you as possible at gencon this year, so send us a tweet if you’re there! If you know a campaign that you think is worthy of Campaign of the Month, be sure to let us know in the forums! Congratulations Twiggyleaf on your well-deserved win! Bowie rules! Three words: It’s About Time! I’ve been a fan of Shimring since the beginning. I’m thrilled to see Twiggyleaf finally getting his due, and the campaign receiving the recognition it so richly deserves. Congratulations! Yes! I’ve long awaited seeing Shimring as the Campaign of the Month. Well deserved! Thanks, Victor. I’ll play Bowie and Lennon’s “Fame” today in celebration and Mike, nice to see you are still lurking! Thanks to all supporters of the campaign and feel free to comment on the Adventure Logs in this final section of the campaign! …and thanks for the twiggybutton, Arsheesh! Awesome news Mark, and well deserved. I’m looking forward to seeing how the final stage of your campaign unfolds. Enjoy!